Ventricular tachycardia (VT) is a potentially life-threatening ventricular arrhythmia that presents as a wide complex tachycardia. It most commonly occurs in patients with structural heart disease or acute myocardial infarction (MI), but may also result from drug toxicity, genetic ion channel disorders, electrolyte abnormalities, or as an idiopathic ventricular arrhythmia in a structurally normal heart. It is important to correctly recognize VT, as it can produce hemodynamic instability, degenerate into ventricular fibrillation, and is a major cause of sudden cardiac death (SCD). Even asymptomatic or hemodynamically stable VT is important to evaluate, as it could reflect underlying heart disease or result in tachycardia-induced cardiomyopathy. VT is defined as ≥ 3 consecutive wide QRS (> 120 ms) beats of ventricular origin with a rate ≥ 100 beats/min. VT that persists for ≥ 30 seconds is termed sustained VT, while VT that lasts < 30 seconds is referred to as non-sustained VT. VT can be further characterized as monomorphic VT, in which the QRS morphology is uniform (See Figure 1), or polymorphic VT, in which the QRS morphology varies beat to beat (See Figure 2). Underlying etiologies of monomorphic VT differ from those of polymorphic VT. The most common cause of sustained monomorphic VT is scar-related re-entry from prior ischemic heart disease. Scarring from other cardiomyopathies (e.g., arrhythmogenic right ventricular cardiomyopathy, hypertrophic obstructive cardiomyopathy, dilated cardiomyopathy) or from prior cardiac surgery can also result in sustained monomorphic VT. In structurally normal hearts, monomorphic VT is termed “idiopathic VT” and is most commonly results from a focal origin, usually in the right ventricular outflow tract. Less often, small re-entry circuits within the Purkinje fascicles can cause idiopathic VT. The most common cause of polymorphic VT is acute myocardial ischemia or infarction. Other causes of polymorphic VT include cardiac ion channel disorders such as congenital long QT syndrome, Brugada syndrome, short QT syndrome, and catecholaminergic polymorphic VT (CPVT). Torsades de pointes (TdP) is a form of polymorphic VT occurring in the setting of a prolonged QT interval when a premature ventricular contraction follows a prolonged cardiac cycle. It is characterized by QRS complexes of changing amplitude that appear to “twist” around the isoelectric line and may be precipitated by QT-prolonging medications or arise spontaneously in states associated with prolongation of the QT interval such as hypokalemia, hypomagnesemia, and long QT syndrome. Though VT is the most common cause of a wide QRS complex tachycardia (WCT), a frequent diagnostic challenge requires distinguishing VT from other causes of WCT, especially SVT with aberrancy. This important topic is discussed in section II. The management and prognosis of ventricular tachycardia differs considerably based on the patient’s clinical status, the classification of VT, and the presence of underlying structural heart disease. While the spectrum of VT presentations is broad, VT syndromes in patients with structurally normal hearts are defined as idiopathic VT and carry a favorable prognosis compared to VT in patients with cardiac disease, which carries a risk of SCD. Moreover, many patients with sustained VT develop hemodynamically instability with hypotension or even unresponsiveness. Pulseless VT is considered a form of pulseless arrest and is treated emergently with immediate defibrillation and cardiopulmonary resuscitaton (CPR), in accordance with advanced cardiac life support (ACLS) algorithms. The management of VF and pulseless VT is discussed in greater detail within ACLS: Sudden cardiac death. In a patient with a WCT, VT is the most likely diagnosis, accounting for up to 80% of all cases. VT is even more likely in patients with known cardiac disease and in the setting of acute MI. Moreover, a WCT of unclear origin in a patient who is hemodynamically unstable should be presumed to represent VT and treated emergently. In a stable patient in whom the etiology of a WCT is unclear, careful investigation of the patient and inspection of the electrocardiogram (ECG) and prior ECGs, if available, are required to distinguish VT from other causes of WCT (See Table I). About 15-20% of WCT represent supraventricular tachycardia (SVT) with abnormal intraventricular conduction due to preexisting bundle branch block (BBB), tachycardia-related aberrancy arising from incomplete recovery from repolarization. Other causes of WCT include pre-excited conduction through accessory pathways, conditions that alter QRS morphology such as severe hyperkalemia, and medication toxicity, though these only account for 1-5% of cases. The typical patient with VT has acute or chronic coronary heart disease or other structural heart disease such as hypertrophic cardiomyopathy, dilated cardiomyopathy, or other less common forms of cardiomyopathy such as infiltrative disease, congenital heart disease, or arrhythmogenic right ventricular cardiomyopathy. The presenting symptoms vary considerably based on the clinical scenario but may include palpitations, lightheadedness, dyspnea, angina, syncope, seizures, and shock. Patients may be clinically stable, unstable, or non-perfusing (pulseless VT). Symptoms of VT typically result from rapid heart rate, underlying heart disease, or another primary medical condition, all of which can also be present in SVT, therefore the presence of specific symptoms is not helpful in determining the tachycardia mechanism in a patient with a WCT of unclear etiology. Additionally, the degree of hemodynamic stability does not distinguish VT from SVT, but it does determine the urgency of therapeutic intervention. Misdiagnosis of VT and SVT based on hemodynamic stability can lead to potentially precarious consequences. In a stable patient with a WCT of unclear etiology, a focused history and physical examination should be directed toward distinguishing VT, which is most common, from SVT with aberration due to preexisting BBB, tachycardia-related aberrancy, or antegrade conduction over an accessory pathway. History of prior myocardial infarction (MI), heart failure, or recent angina has a positive predictive value (PPV) of > 95% for VT; in contrast, only 7% of those with SVT have had an MI. Moreover, the first occurrence of the tachycardia after an MI strongly predicts VT, and WCT in any patient age >35 years predicts VT with a PPV approaching 85%. A history of cardiovascular implantable electronic device raises the possibility of device-associated tachycardia. In contrast, the presence of recurrent, self-limited episodes of tachycardia over a span of years supports a diagnosis of SVT, particularly in a younger patient who lacks structural heart disease or a family history of VT or sudden cardiac death. A comprehensive medication history is also helpful in delineating the tachycardia mechanism. The most common drug-induced tachyarrhythmia is TdP, which is associated with QT-prolonging drugs and antiarrhythmics. Antiarrhythmic drugs implicated include class IA agents (e.g., quinidine, procainamide, disopyramide), class IC agents (e.g., flecainide), and class III agents (e.g., sotalol and amiodarone). Other QT-prolonging agents associated with TdP include antipsychotics (e.g., haloperidol), antibiotics (e.g., clarithromycin, moxifloxacin, and pentamidine), and antiemetics (e.g., chlorpromazine). For a comprehensive list of QT-prolonging drugs, see www.QTdrugs.org. Additionally, digoxin, which can cause almost any cardiac arrhythmia, is also associated with WCTs. Digoxin-associated WCTs include monomorphic VT, accelerated junctional tachycardia (when wide), VF, and bidirectional VT, which is characterized by a regular alternation between two wide QRS morphologies, each having a different axis. Other causes of WCT are listed in Table I. The differentiation of VT from SVT with aberrancy, the most common alternate cause of WCT, is discussed throughout other parts of this section. Patients with VT can have a variety of presentations, ranging from clinically stable to unstable with hemodynamic shock or SCD. As such, an immediate assessment of clinical stability is required in the initial evaluation of a patient with VT. General findings include regular tachycardia, typically with a rate >120 bpm. Unstable patients may have signs of decreased perfusion such as hypotension. Patients with underlying heart failure have findings typical of the condition. Physical exam findings more specific for VT include signs of AV dissociation, especially the presence of cannon A waves in the jugular venous waveform (due to atrial contraction against a closed tricuspid valve), variable intensity of the first heart sound (due to variations in the timing of tricuspid and mitral valve closure), and variation in systolic blood pressure unrelated to respiration (due to dissociated atrial contraction producing variable left ventricular filling). Additional findings include decreased amplitude of pulses, variable splitting of the first and second heart sounds, and intermittent presence of a third or fourth heart sound. In a clinically stable patient in whom SVT with aberrancy is suspected, vagal maneuvers such as carotid sinus massage (performed carefully after examining for bruit) or Valsalva may add additional clues. If the tachycardia terminates, SVT is suggested, however, VT due to a triggered mechanism may also be terminated with vagal maneuvers so test is not completely reliable. The diagnosis of VT can be made on ECG and is discussed in detail in this section. Following treatment of the arrhythmia, additional diagnostic workup is often needed to determine the precipitant (e.g., electrolyte abnormalities or cardiac ischemia) and identify any underlying structural heart disease. 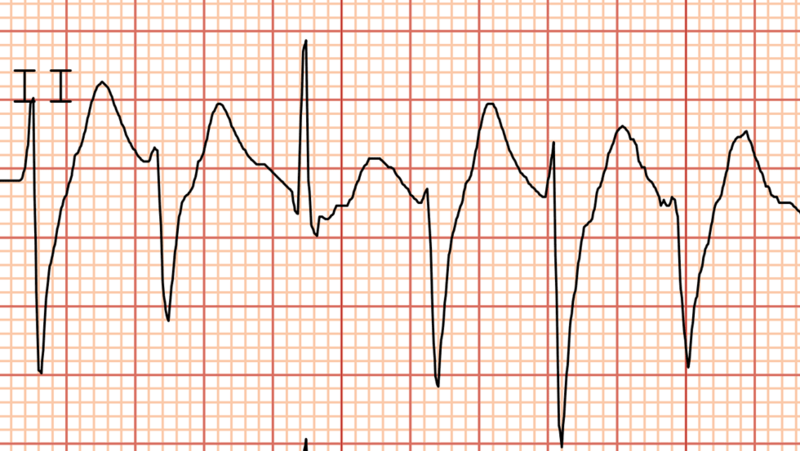 In an emergent situation, VT can usually be identified on an electrocardiographic monitor. In a stable patient, however, a 12-lead ECG is preferable and provides additional information to establish the diagnosis and distinguish VT from other causes of WCT. ECG features permit differentiation between VT and SVT with aberrancy with overall accuracy approaching 90% (See Table II). The hallmark of VT is AV dissociation, which is characterized by atrial activity that is completely independent of ventricular activity (98% specificity). However, complete AV dissociation occurs in only 10-50% of all VTs, while 30% have a 1:1 retrograde ventricular (VA) conduction, and an additional 15-20% have second-degree (2:1 or Wenckebach) VA block. Two additional ECG findings that are helpful in establishing AV dissociation are the presence of fusion beats and the presence of capture (or Dressler) beats, which are generally seen only during slow VT. Fusion beats involve simultaneous ventricular activation from two sources (supraventricular and ventricular ectopic beat), while capture beats represent pure ventricular activation by the supraventricular impulse conducting via the His-Purkinje system. A capture beat is a narrow QRS complex interposed between wide QRS complexes during VT, indicating that the normal conduction system has momentarily captured control of ventricular activation from the VT focus. Other features on the surface ECG that aid in differentiating VT from SVT include QRS width, axis, and morphology (See Table II). Several algorithms have been developed that integrate ECG to help distinguish VT from SVT with aberration. The most commonly used algorithm, proposed by Brugada et al, is both sensitive and specific (per its initial description, up to 98.7% and 96.5%, respectively) for differentiating WCTs (See Figure 3). The Brugada algorithm comprises four steps: In the first step, absence of an RS complex in all precordial leads, while seen in only 21%, diagnoses VT with 100% specificity. If an RS complex is present in one or more precordial leads, the second step requires measurement of the interval between the onset of the R wave and the nadir of the S wave (the RS interval). If the longest RS interval is >100 ms in any precordial lead, the diagnosis of VT can be made with 98% specificity. If there is no RS interval >100 ms, one proceeds to the third step, which requires identifying evidence of AV dissociation (98% specific for VT). If AV dissociation is not present, the fourth step involves examining the morphology of the QRS complex in the precordial leads V1-2 and V6. If both V1-2 and V6 fulfill morphology criteria for VT, the diagnosis of VT is made. If not, VT is excluded and SVT with aberrant conduction is diagnosed. An alternative algorithm proposed by Vereckei et al includes identification of an initial R wave in a VR as a feature diagnostic of VT. Note that these algorithms are limited in their ability to distinguish VT from SVT with antegrade conduction over an accessory pathway (i.e., antidromic AV reentrant tachycardia, AVRT), which produces a QRS complex that is quite different than a traditional BBB pattern because ventricular depolarization starts outside of the normal conduction system, similar to VT. Though antidromic AVRT is relatively uncommon, in a patient in whom the diagnosis may be suspected (e.g., a patient with a known accessory pathway or a young patient lacking structural heart disease), a modified Brugada algorithm can be applied. Following treatment of the arrhythmia, laboratory evaluation is targeted toward identifying the inciting cause. Obtain a chemistry, including potassium, magnesium, calcium, and phosphorus, therapeutic drug levels, and toxicology screen to explore for potentially reversible conditions leading to initiation and sustenance of VT. Evaluate for myocardial ischemia with cardiac biomarkers. In VT, the purpose of diagnostic imaging is to identify any underlying structural heart disease or coronary heart disease. Echocardiography is recommended in all patients with VT to evaluate for the presence of structural abnormalities and regional wall abnormalities. In high-risk individuals, coronary angiography is also often indicated to evaluate for obstructive coronary artery disease. Cardiac stress testing, either with exercise or pharmacologic methods, can also be used to assess for cardiac ischemia. Urgent coronary reperfusion is indicated in patients with polymorphic VT for whom acute ischemia is suspected as the underlying case. Cardiac magnetic resonance imaging (MRI) can be useful in the evaluation of myocardial infiltrative diseases such as sarcoidosis and structural abnormalities such as arrhythmogenic right ventricular cardiomyopathy (ARVC). 2006 guidelines from the ACC/AHA/ESC state that MRI, cardiac computed tomography (CT), or radionuclide angiography can be useful in patients with VT when echocardiography fails to provide accurate evaluation of LV or RV function and/or assessment of structural changes. Electrophysiologic (EP) testing can be helpful in establishing the diagnosis of sustained monomorphic VT when the diagnosis is uncertain. Additionally, EP testing is frequently used to identify patients at high risk for VT who may benefit most from ICD placement, and it may be used to identify an arrhythmogenic focus in a patient in whom radio frequency (RF) ablation is considered. Specifically, 2006 guidelines from the ACC/AHA/ESC recommend EP testing for diagnostic assessment of patients with remote MI and symptoms related to ventricular tachyarrhythmias, including palpitations, presyncope, and syncope, and in patients with coronary heart disease in order to guide and measure the efficacy of VT ablation. Moreover, EP testing is considered reasonable in the evaluation of patients with palpitations or suspected outflow tract VT. EP testing may be useful in patients with recurrent episodes of VT after ICD placement, for whom antiarrhythmic drugs are not desired or not tolerated, to identify arrhythmogenic foci amenable to ablation. F. Over-utilized or "wasted" diagnostic tests associated with the evaluation of this problem. In outpatients with unexplained episodes of palpitations or syncope, continuous ambulatory (or Holter) ECG is frequently ordered in order to determine the etiology. This approach, which typically involves 24-48 hours of continuous monitoring, is effective in patients with frequent symptoms and may prove useful in identifying frequent ventricular ectopy, but it is limited in its ability to diagnose sustained VT, which occurs relatively infrequently. In patients in whom episodes of symptomatic, sustained VT is suspected but episodic, monitoring using an external continuous ECG monitor (e.g., Zio patch) or implantable loop recorders permits longer-term (>48 hours) evaluation and may be diagnostically helpful. Management of ventricular tachycardia can be stratified into two categories: acute management (or termination of arrhythmia) and long-term therapy to prevent recurrence or sudden cardiac death. Hemodynamic compromise may occur rapidly with VT and the initial management of any patient with VT requires an immediate assessment of clinical stability. An unresponsive or pulseless patient with VT should be treated emergently with immediate high-energy defibrillation and CPR, in accordance with advanced cardiac life support (ACLS) algorithms. The management of VF and pulseless VT is discussed in greater detail within ACLS: Sudden cardiac death. A patient who is unstable or symptomatic from sustained VT (hypotension, shock, angina, congestive heart failure or symptoms of cerebral hypoperfusion) who has a discernible pulse and/or blood pressure should be treated with emergent synchronized direct current cardioversion. Initial cardioversion is performed with a synchronized shock of 100 to 200 joules (monophasic) or 50 to 100 joules (biphasic), with titration of the energy upward as needed. If the synchronized shock is not possible due to inability to distinguish QRS and T wave, patients should be treated with immediate defibrillation (i.e., unsynchronized shock using 360 joules [monophasic] or 200 joules [biphasic]). Intravenous analgesics or sedatives can be used cautiously prior to shock in a conscious individual as it can precipitate hemodynamic comprise. VT in a hemodynamically stable patient can be terminated with pharmacologic agents. The choice of agent, as well as use of adjunctive therapies, depends on the type of VT present. Amiodarone, procainamide, and lidocaine can all be effective in treatment of sustained monomorphic VT. Choice of agent depends on the clinical scenario. IV amiodarone is useful in hemodynamically tenuous or unstable VT as it has minimal hemodynamic effect and a slower onset of action. Amiodarone may be used in combination with DCCV in truly unstable patients and is also helpful in shock resistant VT and VT unresponsive to other antiarrhythmic drugs. Hypotension associated with intravenous amiodarone infusion is caused largely by the diluent in which earlier formulations of amiodarone were mixed, and does not seem to be as frequent in newer formulations. If hypotension occurs, it is usually related to the rate of infusion and can be improved at slower rates. IV procainamide may be considered in patients with monomorphic VT who are hemodynamically stable, as it rapidly slows and terminates VT but can cause hypotension in up to 20% of patients. IV Lidocaine may be helpful for sustained monomorphic VT in the setting of cardiac ischemia or infarction. It is less effective in slow or stable VT. IV Lidocaine does not prolong the QT interval. Transvenous overdrive pace termination can be useful for VT that is refractory to cardioversion or is frequently recurrent despite antiarrhythmic medications. Recurrent or incessant polymorphic VT due to acute myocardial ischemia requires urgent revascularization. IV beta-blockers are useful in recurrent polymorphic VT, especially if there is concern for ischemia. IV amiodarone can be used in recurrent polymorphic VT as long as there is no concern for underlying congenital or acquired prolonged QT intervals. Targeted therapies exist for management of VT in structurally normal heart, such as IV beta blockade in idiopathic monomorphic VT and catecholaminergic polymorphic VT or isoproterenol in VT from Brugada Syndrome. Electrical storm can be defined as 3 or more episodes of VT within 24 hours. Treatment includes DCCV and IV antiarrhythmics as above. Refractory cases may require blocking of sympathetic input to the heart with general anesthesia such as propofol. Catheter ablation can be helpful in terminating electrical storm, with reported efficacy of 48% of patients after first attempt and 84% of patients after multiple ablations. Hemodynamically unstable torsades de pointes (TdP) is treated emergently with non-synchronized defibrillation shock with 200J. Intravenous magnesium sulfate given as a 2-4 gram infusion over 1 to 2-minutes is highly effective in treatment and prevention of TdP in patients with long QT intervals, even with normal baseline serum magnesium. Transvenous overdrive pacing at a rate of 100 beats per minute will reduce the QT interval. Isoproterenol infusion at 2mcg/minute in adults titrated to heart rate of 100 beats per minute can be used to decrease QT interval and can be used as a temporary measure prior to pacing in patients who do not have congenital long QT syndrome. Patients with TdP from congenital long QT syndrome should be acutely managed with pacing along with beta-blockade and IV lidocaine. Beta-blockade combined with pacing can also be used acutely in TdP and sinus bradycardia. In all patients with TdP, offending QT prolonging drugs should be removed and serum electrolytes should be corrected and diligently maintained at normal levels. Long-term pacing is indicated for patients who have TdP due to symptomatic bradycardia, heart block, or recurrent. See section II for description of the physical evaluation of patients with VT. Additionally, a baseline comprehensive eye, pulmonary, and thyroid examination is indicated in patients started on amiodarone. Skin should be examined for any burns in patients receiving multiple shocks to stabilize rhythm. Patients who have received ICD for secondary prevention their incision site should be examined for any infection. Patients who underwent cardiac catheterization to assess coronary artery disease as a precipitant for arrhythmia should have peripheral pulses monitored for embolic phenomena and site should be examined for any hematoma or pseudoaneurysm. Electrocardiography should be obtained daily in patients to monitor for QT interval in patients who were started on antiarrhythmic agents including amiodarone, sotalol and procianmide. The dose of the drug should be reduced 50% if QTc is noted to be more than 500msec. Electrolytes including potassium and magnesium should be checked daily in patients with VT.
Liver and thyroid function should be monitored periodically on patients taking chronic amiodarone. Risk of hepatotoxicity likely relates to total cumulative dose of amiodarone whereas thyrotoxicity risk relates to a patient’s underlying thyroid status and dietary iodine intake. The goal of long-term therapy is to prevent sudden cardiac death and recurrence of ventricular arrhythmia. Multiple ICD trials have demonstrated the superiority of an ICD over anti-arrhythmic drugs for primary prevention of sudden cardiac death in patients at risk for a life-threatening ventricular arrhythmia. The Multicenter Automatic Defibrillator Implantation Trial (MADIT) and Multicenter Unsustained Tachycardia Trial (MUSTT) trial have shown that patients with ischemic cardiomyopathy (ejection fraction <35%) and who have inducible VT on electrophysiology study that was not suppressed with drugs saw improved survival rates with an implantable cardioverter defibrillator (ICD). Later, the MADIT-II study found that patients with ischemic cardiomyopathy with an ejection fraction of 30% or less had improved survival rates with treatment with an ICD, with no pre-requisite to document ventricular arrhythmia on electrophysiology study (HR 0.69). The SCD-HeFT trial demonstrated improved survival with ICD compared to conventional therapy or amiodarone among patients with either ischemic or non-ischemic cardiomyopathy, LVEF <35%, and NYHA Class II/III symptoms. In addition, patients who meet criteria for cardiac resynchronization therapy (CRT) should be considered for placement of combined biventricular pacing and ICD device. For secondary prevention of sustained VT or cardiac arrest in patients with structural heart disease, it is now clear from several clinical trials that ICDs provide improved survival when compared to amiodarone, sotalol, or beta-blockers, that class I antiarrhythmic drugs actually increase mortality, and that amiodarone and sotalol can reduce the number of device therapies but may not reduce mortality. Therefore, in patients who have survived a cardiac arrest or who have had sustained VT that resulted in hemodynamic compromise and poor LV function, an ICD is the treatment of choice. In patients who refuse an ICD or who have poor life expectancy, empiric amiodarone may be the next best therapy. Some patients who receive ICDs have frequent shocks because of recurrent VT. In these patients, concomitant therapy with amiodarone can be required to reduce the frequency of VT or to slow the rate of the VT to allow it to be pace-terminated. Radiofrequency ablation can also be considered and may be helpful in reducing the rate of recurrent VT and shocks delivered in patients with ICDs. The success rate of ablation depends on the type of VT, with high success rates in normal hearts approaching 90%. Electrocardiography should be obtained daily in patients to monitor for QT interval in patients who were stared on antiarrhythmic agents including amiodarone, sotalol and procianmide. The dose of the drug should be reduced 50% if QTc is noted to be more than 500msec. Electrolytes including potassium and magnesium should be checked and corrected daily in patients with VT. Impaired renal function can increase the terminal half-life of sotalol, resulting in increased drug accumulation. The dose of sotalol should be modified based on creatinine clearance. Amiodarone is safe drug to use in patients with impaired renal function. In patients with elevated liver enzymes (double or three times the baseline), consider discontinuing or reducing the dose of amiodarone. Amiodarone is safe drug to use in ventricular arrhythmias in setting of LV dysfunction. Vaughan Williams Class Ic drugs (Flecainide and propafenone) should be avoided in patients with structural heart disease as they may increase mortality. Class IC drugs (Flecainide and propafenone) increases the risk of proarrythmia in the setting of coronary artery disease. Patients should have a reasonable expectation of survival with good functional status for > 1 year before being considered for device therapy. Check electrolytes and replace potassium if less than 4meq and replace magnesium if less than 2meq. Hypokalemia and hypomagnesemia can predispose to the development of ventricular tachyarrhythmias. Cardiac enzymes including troponin, CPK, and CPK-MB should be followed closely in patients with VT to rule out ischemia as a cause of ventricular arrhythmia. Patients with VT who qualify for ICD implantation based on ACC/AHA 2006 guidelines should receive ICD before discharge. Pharmacological therapies should be optimized prior to discharge if patient does not meet the criteria for ICD or chooses against it. Patients who already had ICD and experiences VT should have ICD interrogated prior to discharge and pharmacologic therapies should be optimized, or radiofrequency catheter ablation considered, to reduce the incidence of shocks. In patients initiated on amiodarone, amiodarone infusion should be maintained for at least 24-48 hours after loading dose to maintain steady state level of drug, and later switched to oral formulations. Patients should be monitored on oral formulations of drug for at least 24 hours before discharge. Patients can be considered for discharge when they are free of episodes of sustained VT for at least 24 to 48 hours after the therapies used to control the arrhythmia have been optimized and reversible etiologies have been addressed. Cardiology clinic / Electrophysiology clinic for interrogation of ICD, optimization of drug therapy and potential for ablation for recurrent VT.
Primary care clinic to monitor electrolytes, drug levels and monitor adverse effects related to drugs. Cardiology or EP follow-up should be arranged within one week of discharge. Baseline thyroid function, liver function, pulmonary function and ophthalmologic examination should be performed when amiodarone is initiated. Basic metabolic panel to assess electrolytes. Digoxin level in patients taking digoxin. Electrocardiography to monitor QT interval in patients started on amiodarone, sotalol, ibutilide, dofetilide, or procainamide. Prognosis in VT is determined by type of VT, underlying cardiac condition and left ventricular function. Reduced left ventricular function and VT carry a worse prognosis than does either alone. In patients with structurally normal hearts, ventricular arrhythmias are usually benign and carry an excellent prognosis unless there is strong family history of sudden cardiac death. This includes patients with long QT, right ventricular cardiomyopathy, and hypertrophic cardiomyopathy who are at increased risk of cardiac arrest with concomitant history of first and second degree relative with sudden cardiac death. In patients with structural heart disease (often coronary artery disease), ventricular arrhythmia is an adverse prognostic factor associated with cardiac arrest and death. Sustained VT in structurally abnormal heart has high mortality risk of about 20% at 2 years. Several randomized controlled trials have shown that use of an ICD can reduce mortality by almost 30%. Document whether or not an ICD was implanted. If it was not, clearly state why the patient didn’t receive an ICD. Once the patient is stable and the arrhythmia under control, attention should turn to minimizing recurrence, and further, prevention of SCD. See section III for a detailed discussion on prevention of recurrent VT.
Zipes, DP, Camm, AJ, Borggrefe, M. “ACC/AHA/ESC 2006 guidelines for management of patients with ventricular arrhythmias and the prevention of sudden cardiac death: a report of the American College of Cardiology/American Heart Association Task Force and the European Society of Cardiology Committee for Practice guidelines (writing committee to develop guidelines for management of patients with ventricular arrhythmias and the prevention of sudden cardiac death): developed in collaboration with the European Heart Rhythm Association and the Heart Rhythm Society”. Circulation. vol. 114. 2006. pp. e385-484. Buxton, AE, Lee, KL, Fisher, JD. “A randomized study of the prevention of sudden death in patients with coronary artery disease. Multicenter Unsustained Tachycardia Trial Investigators”. N Engl J Med. vol. 341. 1999. pp. 1882-90. Epstein, AE, DiMarco, JP, Ellenbogen, KA. “ACC/AHA/HRS 2008 guidelines for device-based therapy of cardiac rhythm abnormalities”. J Am Coll Cardiol. vol. 51. 2008. pp. e1-62. Hohnloser, SH, Kuck, KH, Dorian, P. “Prophylactic use of an implantable cardioverter-defibrillator after acute myocardial infarction”. N Engl J Med. vol. 351. 2004. pp. 2481-2488. Bardy, GH, Lee, KL, Mark, DB. “Amiodarone or an implantable cardioverter-defibrillator for congestive heart failure”. N Engl J Med. vol. 352. 2005. pp. 225-237. Moss, AJ, Zareba, W, Hall, WJ. “Prophylactic implantation of a defibrillator in patients with myocardial infarction and reduced ejection fraction”. N Engl J Med. vol. 346. 2002. pp. 877-883. Kadish, A, Dyer, A, Daubert, JP. “Prophylactic defibrillator implantation in patients with nonischemic dilated cardiomyopathy”. N Engl J Med. vol. 350. 2004. pp. 2151-2158. Roberts-Thomson, KC, Lau, DH, Sanders, P. “The diagnosis and management of ventricular arrhythmias”. Nat Rev Cardiol. vol. 8. 2011. pp. 311-21. (This reference is an excellent review that summarizes the acute and long-term management of VT that is separated by type of VT [monomorphic vs polymorphic, structural heart disease vs not]).